I have not for the life of me, been able to figure out what to call these "busts." Nothing clever or moving would come to mind. They are just busts. I was making doll heads of different ethnic groups. I felt horrible just to have them strewn about, begging me to make something of them. Nothing worse than looking over into the accusing eyes of a would-be doll, knowing that you have no intention of making a doll at that moment. So, the busts were born! They are approximately 6" tall, attached to a wooden base. And despite all the guilt they caused me, I thoroughly enjoyed making them. 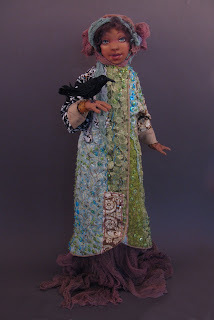 One of the doll organizations I belong to, TAODA (Texas Association of Original Doll Artists), is an amazing group or original doll artists. This coming weekend we have a gallery show in Galveston, TX, called "Bathing Beauties". 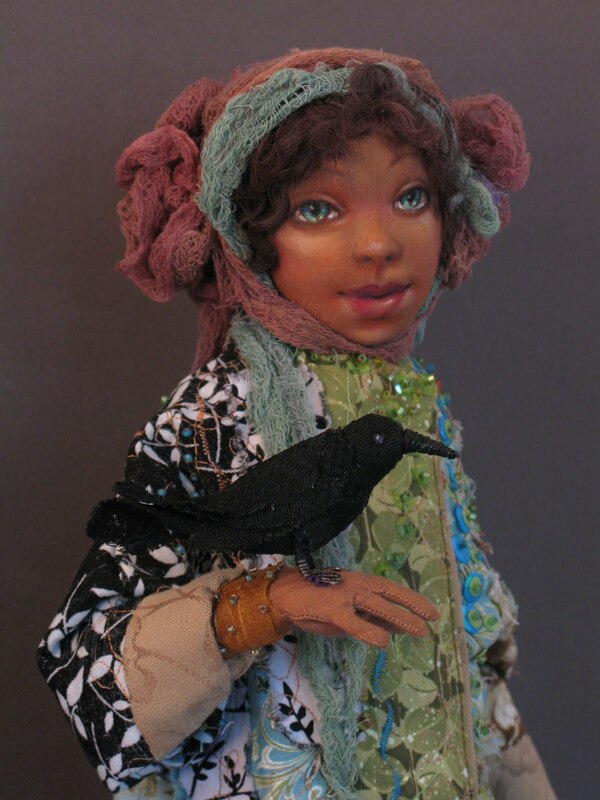 This is my doll for the show, "Perle". Perle and her family are enjoying a sunny day at the beach, actually it is Perle's family that is enjoying the day. She however is terrified that someone will comment on her knobby knees! She was beside herself with joy when her Aunt Rilla promised her a new sunbathing suit. She began dreaming of a bright pink or soft yellow day dress that would garner her many appreciative stares as she walked up and down the beach. I needn't tell you of how her face fell when she opened the beautifully wrapped packaged her aunt had brought all the way from Boston and saw the blue short set inside. Her mother was quite embarrassed by her lack of graces.... but she quickly recovered and pasted a somewhat stiff smile in place. Her aunt was overjoyed. Poor Perle could only think about how a short set...and a blue one at that, would show her knees to a less than fashionable advantage. How mortifying! Perle, usually loved the beach. Darting around finding shells that her mother would put in jars and so that Perle and her sister could put them around for decor. Today, her heart was just not in shell hunting. But not wanting to give any of her brother's less-than-kind friends time to remark on her clothing, she went in search of a quiet cove. After what seemed like an eternity of searching, she found a cove that was only inhabited by a family of egrets. The sand was so lovely in this part of the beach...bright yellow and glittery. And the shells were in abundance! beautiful shell that had a pearl in it! Maybe it wasn't going to be a bad day after all! Perle is about 16" tall, including her hand-painted base. 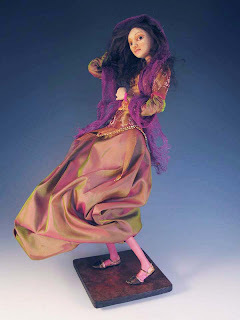 She is a cloth doll, made over a wire armature. This is another version of Abundance that I made this summer. I had the honor of teaching her to a great group of women here in my neck of the woods! The Material Girls of Houston kindly had me teach her as a class this fall. 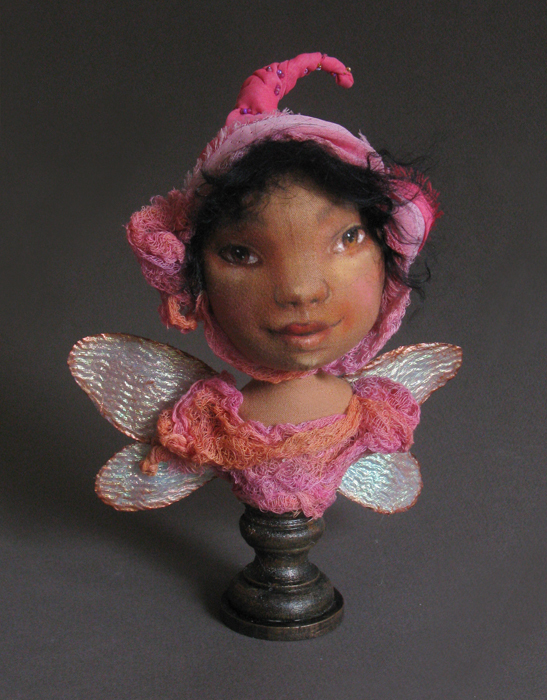 Abundance is about 18", and fully cloth. No paper clay this time! 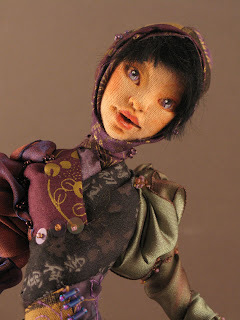 I think she is an enjoyable doll to make, because she is fairly easy to construct....and most of your time is spent on embellishing her, one of my favorite parts of doll making! I don't know if you suffer from this, but sometimes the more behind on something that I get, the harder it is to make myself catch up. Such as blogging. If I miss more than a few months, I find it almost impossible to add an entry. So to "help" myself get over my self-imposed phobia, I've redesigned my blog. I'm still of the opinion that blogger does not make the process of changing a blog easy, but after spending all the time it took to just fix the margins, I kind of feel it's worth it to start blogging again. 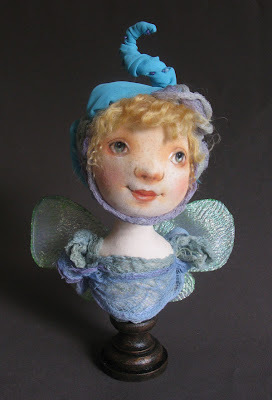 Here are 2 dolls that I worked on over the last year. 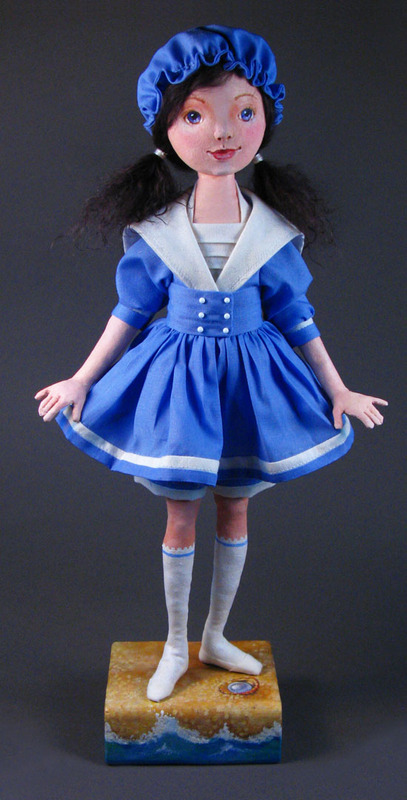 The first doll is called Reluctance. 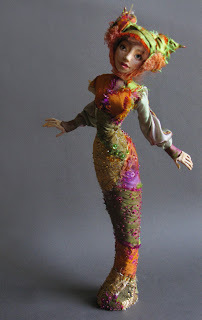 She is a paper clay doll made over a wire armature. Reluctance is about 22" tall, if she were to be standing. 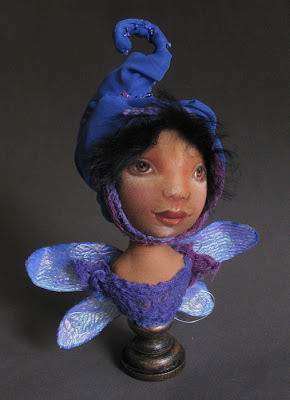 This next doll is called Réalití. She is also a paper clay, stump body doll. She stands about 18" tall. As always, I enjoyed making them both....and finally sharing them with you! J.W. Waterhouse is probably one of my favorite painters. This doll is called "Ode to Waterhouse" as a nod to his work "Windflowers". 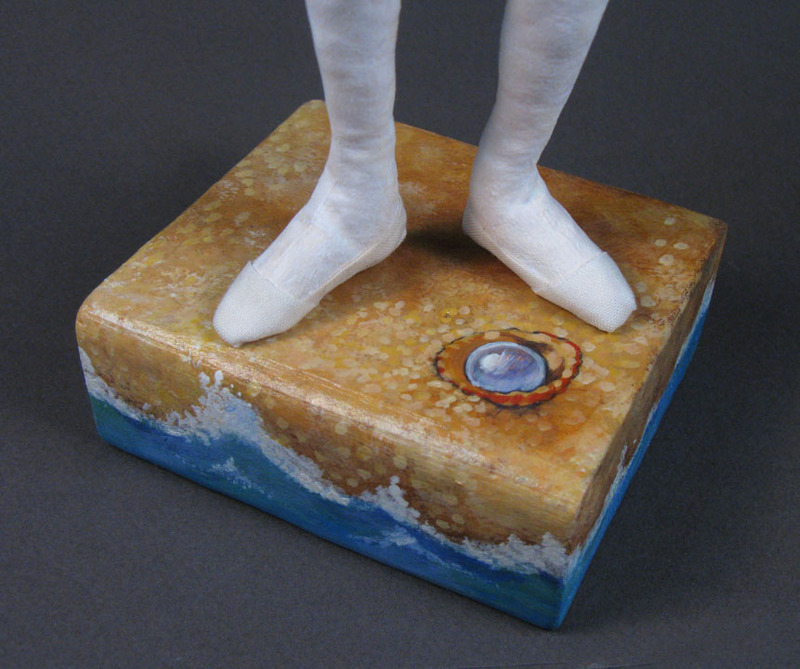 "Ode to Waterhouse" is 18" tall with base included. 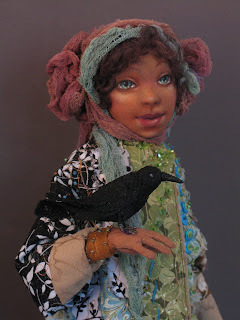 I really enjoyed making her, especially sculpting and painting her face. 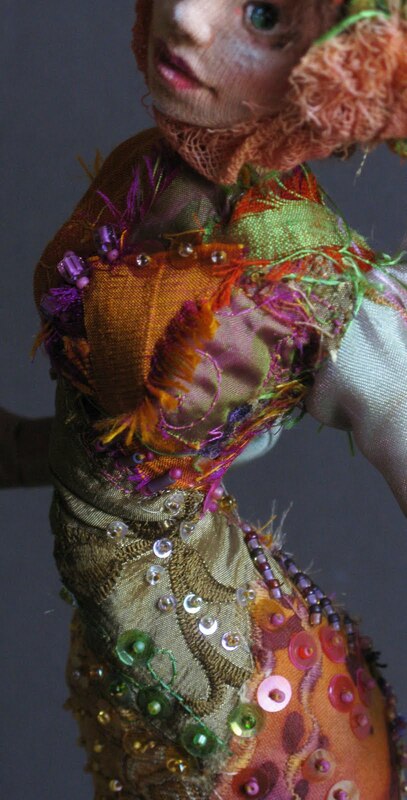 Her clothing is from bits of silk and satin, laces and bead embellishments. At the end of the charade we were all laughing hysterically! 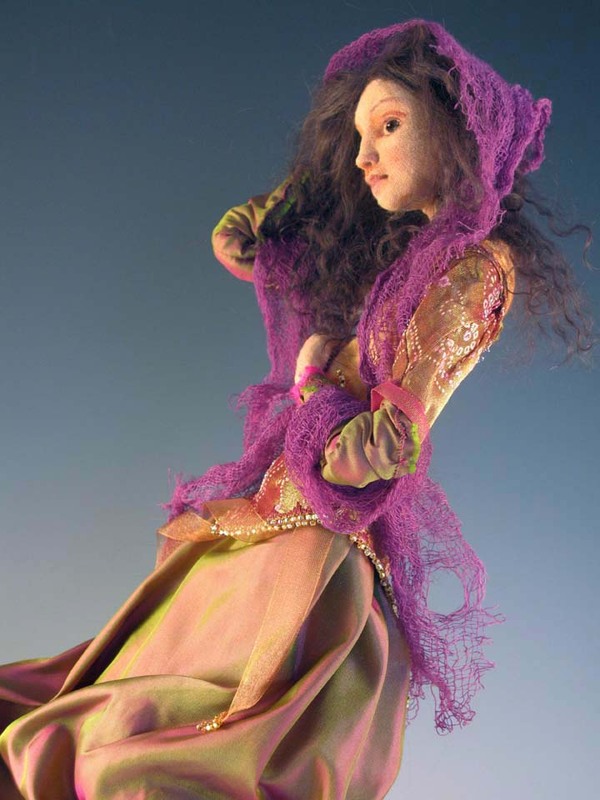 That's when the idea of the doll came to me. 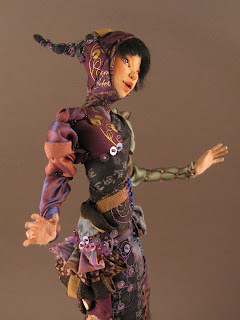 Pantomime Joy is 15" tall. She is sculpted from paper clay and covered with fabric. Her facial features are done in pastels and colored pencils. I don't know if she is as successful in her pantomime as my daughter was in conveying "happy"...but I do wish you joy and contentment and the hope that in your life joy will become real....and not just a pantomime. 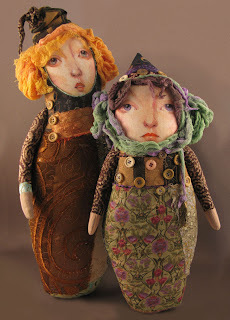 These dolls are sort of a tribute to sisterly boredom! I have 3 girls and for the most part they get along in a grand fashion. But every now and then they get really, really tired of playing together. These dolls, OPHELIA and her older SISTER capture the look. I want to do a third doll that will represent my youngest daughter. 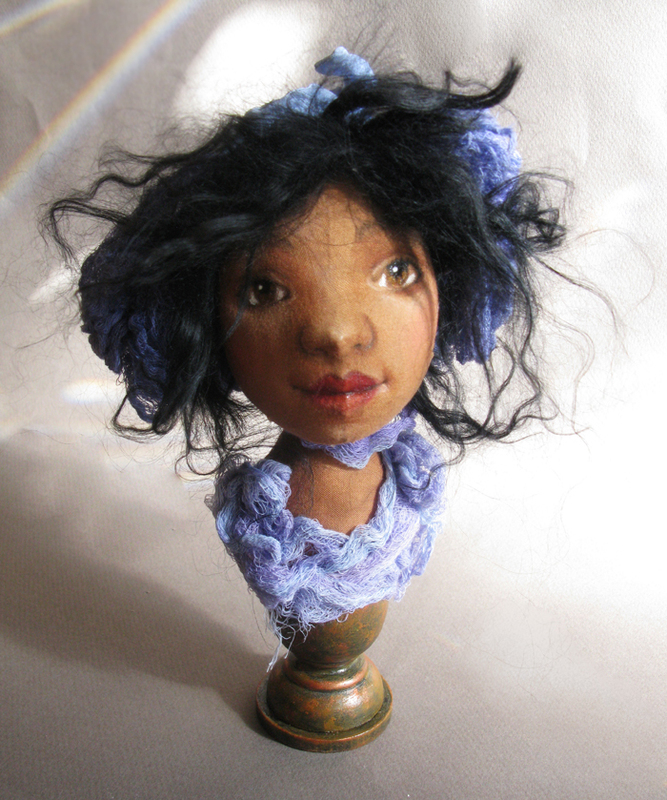 I just have to figure out how to make a doll look like it is talking non-stop! This is Arisa. 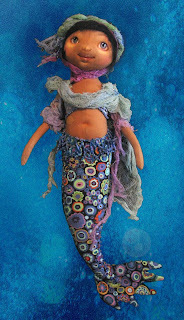 She is a companion child mermaid to a mermaid I made a while ago. 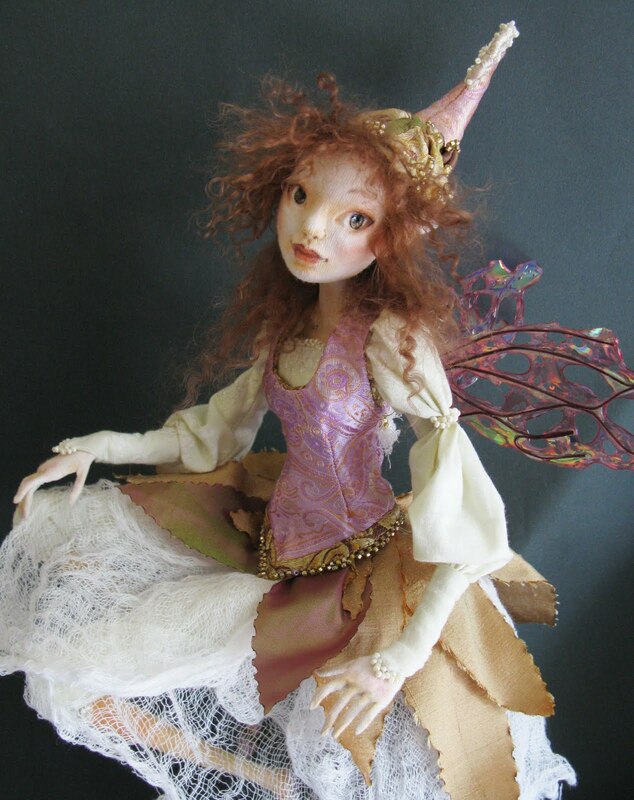 She is about 12" tall and the pattern for her will be included in my online class Enkai Nou . 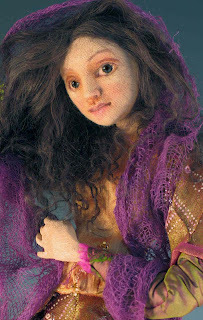 She is a cloth doll with a softly needle sculpted face. Her features are pastel, and watercolor pencils. 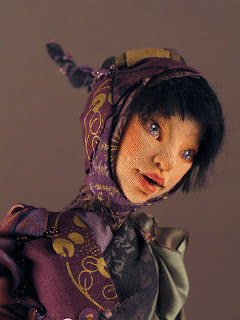 Arisa is a wall doll and I'm rather fond of her as she looks like my daughters....minus the tail! I can't tell you how pleased I am that you take the time to stop by and visit! Your comments really make my day.....I wish I could have all of you over for tea and cookies! I read each and every comment and will answer any questions within the comments (so please, check back!) Take care! This is a Flickr badge showing public photos from whimsymoondesigns. Make your own badge here.